Acronyms are a natural fit for social media networks. These platforms are based on short and snappy communication, so it makes sense for people to rely on abbreviations, especially for common phrases. But understanding shorthand isn’t just important for the messages you send. There are social media acronyms that you’ll find in business meetings, in marketing or sales reports, and from your IT team. To be the best at your job, you’ll need to know all of the most common abbreviations. This list of acronyms can help you stay fresh with the latest lingo, online and off. To start, it’s probably most helpful to review some of the common acronyms that are tied to specific social media networks. They’re generally intuitive, but you should be sure they’re locked in your brain. There are also a few regularly used acronyms that describe features on those networks. If you’re on Twitter in particular, these are a must-know for improving your communications among team members and with your online audience. 5. DM: A “Direct Message” is a one-on-one message sent on Twitter that is only visible to the two individuals exchanging them. 6. MT: Sometimes when you’re resharing a Tweet, you’ll alter the text. That makes it a “Modified Tweet.” That may mean shortening it to fit within the character limit or removing the poster’s handle if they have a private account. 7. PM: “Private message” is the more general term for any one-on-one communication that’s not visible to the public. It includes DMs. 8. RT: A “Retweet” is when you publish somebody else’s Tweet, in its entirety, to your own feed. Business experts have always had a unique set of terminology. Many of the general terms that would come up in marketing meetings are equally useful in a social media context. 9. B2B: This “business to business” label refers to companies that are selling to other companies. 10. B2C: On the other hand, “business to consumer” designates a company that is selling to individuals. 12. CMS: A “content management system” is the tool you use for editing, scheduling and publishing any written material for the web. 13. CPC: The “cost per click” is the dollar amount an advertiser pays for every person who clicks on an ad. 14. CPM: “Cost per thousand” measures an ad’s impressions rather than its clicks (as in CPC). 15. CR: The “conversion rate” is a simple equation: the number of people who take an action divided by the number who could have. 16. CTA: A “call to action” is a statement that asks the reader to do something. This is usually a specific action related to building the company’s social presence or to getting involved in a marketing push. 17. CTR: The “clickthrough rate” is a particular type of conversion rate where the action in question is clicking on a link. 18. KPI: A “key performance indicator” is a metric your team or business uses to measure success in achieving goals. For social media, this could be a measurement of engagement, conversions, shares or clicks, depending on your purpose in being on those networks. 19. PPC: “Pay per click” is a metric for advertising costs that’s the same as CPC. 21. ROI: “Return on investment” measures the money you make in relation to the money you spent to make it. It’s a way of assessing the success of certain promotional or advertising efforts. 22. UGC: The term “user generated content” encompasses any written or visual material that the individuals using a platform create, from comments or blog posts, to photos or video clips. 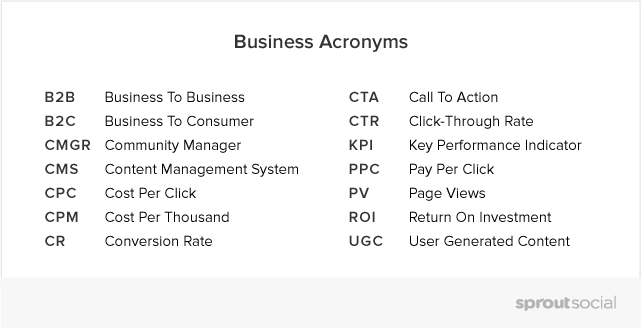 These may not come up frequently in your regular water-cooler chats, but it’s useful for anybody working in social to understand some of the most relevant technical abbreviations. These cover a range of acronyms related to online business that could come up in a chat with the IT team or when dealing with a customer support ticket. In either case, you don’t want to be nodding along without knowing what’s being discussed. 23. API: An “application programming interface” is a set of rules for how pieces of software interact. Your social media management tools use the APIs of Facebook, Twitter and the other networks to post and schedule. 24. ESP: Your “email service provider” is the software used for sending emails. This can be an outside service used for email blasts to your audience or for powering your internal team communications. 25. HTML: You see these letters all the time, and they stand for “hyper text markup language.” It’s the coding language used to build all webpages. 26. ISP: Just as the ESP is the business supplying your email needs, your “Internet service provider” is the company powering your Internet service. 27. RSS: A “really simple syndication” is a feed of all posted content from a source, usually a blog. 28. SaaS: This is an abbreviation for “software as a service,” which is a subset of companies that are in the business of providing software programs. 29. SEM: “Search engine marketing” is how businesses leverage search engines for marketing purposes. 30. SEO: “Search engine optimization” is a form of SEM. It refers to the choices you make in your written content that are designed to make sure that your creations appear high in the rankings of the correct search terms. 31. TOS: “Terms of service.” Just about any online service, including social networks, has a Terms of Service that you must agree to in order to use it. Marketers will want to keep an eye out for any limitations on business activity and details about ownership, both of your content and your data. 32. UI: The “user interface” is the display that a person uses to control a tool. 33. UX: The “user experience” is a person’s response and reaction to taking actions within a tool. Need to STMYSP (“save time managing your social profiles”)? See how Sprout Social can increase your efficiency and help you engage with your audience with a free 30-day trial. Sign up now! 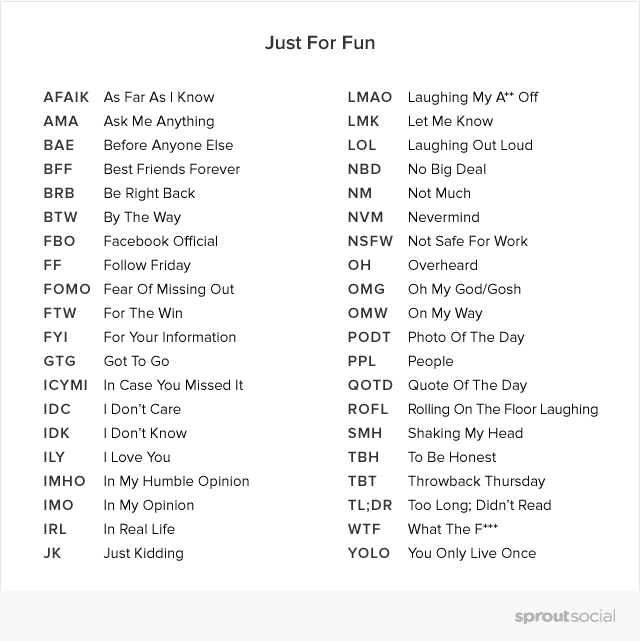 Many of these acronyms crossed over into social media from texting or from online shorthand used in forums. Some of them have been bandied around the Internet for years, but others are more modern inventions. You’ll most likely find these in the public posts made and shared by your followers, or in their comments on your social content. Some of them also get turned into popular hashtags that individuals and brands alike can take advantage of. 35. AMA: Stands for “ask me anything.” Often used to signal an open Q&A opportunity on a social channel. 36. BAE: This abbreviation means “before anyone else,” and is one of the more recent creations. Typically it refers to a person’s significant other, but could be a very close friend as well. 38. BRB: “Be right back.” This comes up most often in the context of real-time messaging or chat services. 40. FBO: Stands for “Facebook official.” This most often refers to making a public announcement of a life development, such as a new job or new relationship, on Facebook to your entire social audience. 41. FF: The “follow Friday” trend began as a Twitter hashtag for recommending people who merit attention on social. These days, most users don’t make this a weekly update, but save it for giving a signal boost to especially interesting or important social profiles. 43. FTW: This acronym of “for the win” initiated in the gaming world, but has become a cry of victory or success for all. 44. FYI: “For your information.” Another classic that’s still in frequent rotation. 45. GTG: “Got to go” can end a conversation. 46. ICYMI: “In case you missed it” most frequently is used when sharing content that is not current. That could be a news item from a few days prior or an evergreen blog post that you want to return to circulation. 52. IRL: This acronym means “in real life,” and is meant to distinguish between people’s online and offline lives. 53. JK: This phrase is “just kidding,” and can be helpful in conveying a light-hearted tone when there’s a possibility for a statement to be misconstrued. 54. LMAO: Stands for “laughing my a** off.” Not always the right phrase for a business context, but makes it just as necessary to know this acronym when you see it. 60. NSFW: The label “not safe for work” usually designates material that is violent, sexual or otherwise inappropriate for a professional setting. 61. OH: Stands for “overheard.” Generally used as context for quotes. 68. SMH: This stands for “shaking my head” and is most frequently used to express shock or dismay. 70. TBT: If you’re sharing an old photo, you’ll most likely want to use the hashtag for “throwback Thursday.” Just make sure you post on the right day of the week! 74. YOLO: The phrase originated in a song by rapper Drake, but the acronym of “you only live once” has also caught on in social communication.